Most useful spell of it's time, when mecha mage was life! Never noticed before, but the card art is amazing. i use this in my mech decks for snuffing out stealth... also works good as a removal as long as you can isolate your hard targets. Is it just me, or is this card a little overpowered right now? 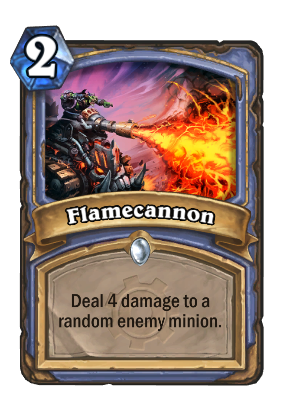 I mean, as far as tempo mages can already have insane turn one plays with coin especially, they can also easily remove a small to medium threat for only 2 mana. I'm not sure really if this card is balanced. Maybe make it 3 mana and let it hit face, since it can kill stealthed minions. If it hit face, it would be horrid. Right now, the only real problem I see is that it can kill Shade of Naxxramass and Spider Tanks, but removal is supposed to be cheaper than the things it removes anyways. If you're playing your cards right, this should never be worse than Shadow Bolt. In fact, since this can hit minions with Stealth or the Faerie Dragon ability, it's much, much better. An interesting new mage spell — seems pretty balanced overall, or maybe even slightly underwhelming. An untargeted four damage will very often overkill a minion -- and with tons of tokens / deathrattle leftover minions around, this card seems best against control decks. You say that, but think about how horrid it would be to have your Gilblin Stalker die before it could do anything. Random effect might screw you over though. EDIT: Didn't read that it's for a minion, lol. Not broken in the slightest, might get decent value against a control deck, but against aggro, this might overkill and kill a 1 health minion, or hit a Creeper/Egg.